JARVIS, SAMUEL PETERS, militia officer, office holder, and lawyer; b. 15 Nov. 1792 in Newark (Niagara-on-the-Lake), Upper Canada, eldest surviving son of William Jarvis* and Hannah Peters*; m. 1 Oct. 1818 Mary Boyles Powell, daughter of Chief Justice William Dummer Powell*, in York (Toronto), and they had five sons and four daughters; d. 6 Sept. 1857 in Toronto. 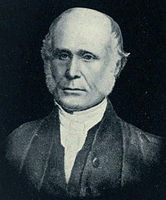 Samuel Peters Jarvis enjoyed an initial advantage in the emerging colonial society of Upper Canada. 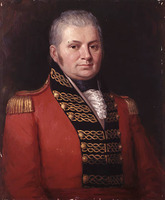 His father, who had gained the patronage of Lieutenant Governor John Graves Simcoe*, was the first provincial secretary and registrar, and, while the Jarvis family was not wealthy, it did enjoy the comparative luxury of three servants to minister to household needs. 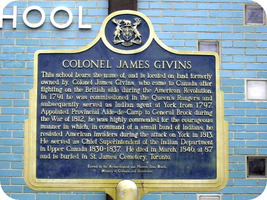 Young Jarvis was educated along with many of his peers by the Reverend John Strachan* at his Cornwall grammar school. In 1810 he was articled to Attorney General William Firth*, but his law studies in York were interrupted by the War of 1812. 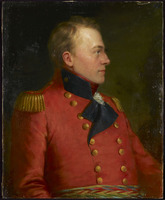 He joined Captain Stephen Heward’s flank company in the 3rd York Militia which assisted Major-General Isaac Brock* at the capture of Detroit in August 1812 and at Queenston Heights in October. After that battle he acted as one of the pallbearers for Lieutenant-Colonel John Macdonell* (Greenfield) when he was interred with Brock at Fort George (Niagara-on-the-Lake). Jarvis later saw action in the engagements at Stoney Creek and Lundy’s Lane. He also obtained several minor administrative posts during the war: in January 1814 he was commissioned to act as assistant secretary and registrar to his father, and that December, in the absence of John Powell, he was made clerk of the Legislative Council. 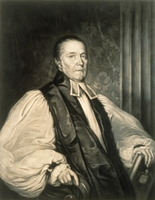 Jarvis was called to the bar in 1815. Two years later he was appointed clerk of the crown in chancery, an administrative post in the House of Assembly which he was to hold for the next 20 years. His real ambition, however, was to follow in his father’s footsteps as provincial secretary and registrar, a position which he seemed to feel should be his by right of succession as the eldest Jarvis male. Circumstances and his own personality thwarted that ambition. Jarvis possessed a fiery temperament and an impetuous nature combined with a strong sense of family and personal honour. Such traits involved him in a number of incidents, most of which came to nothing. In 1817, however, the feud which had simmered for a decade between the Ridout and Jarvis families came to a head when Samuel quarrelled with 18-year-old John Ridout, a son of Surveyor General Thomas Ridout*. On 12 July Jarvis and Ridout, accompanied by their seconds Henry John Boulton* and James Edward Small*, confronted each other just north of the town of York, and Ridout was killed. The duel badly split the local élite: the Ridouts certainly never forgave Jarvis for his part in the affair. The timing of the duel was also unfortunate for the development of his career, since his father died that August while Samuel was in jail awaiting trial. Although the courts exonerated him in the fall, his position at the centre of controversy temporarily ruined his chances for preferment. Duncan Cameron was appointed to the coveted secretaryship, though Jarvis briefly filled the position in Cameron’s absence. 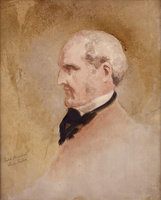 He also succeeded Cameron as civil and private secretary to the acting lieutenant governor, Samuel Smith*, and served in that capacity until August 1818. During the summer of 1818 Jarvis moved to Queenston and pursued an active career in law there and later in Niagara. In 1824 he returned to York where, nearly a decade after the fatal duel, he again became enmeshed in a cause célèbre. On 8 June 1826, in response to the vitriolic and sometimes personal attacks of the Colonial Advocate, a group of tory young bloods invaded William Lyon Mackenzie*’s shop, damaging the interior and scattering his printing type. 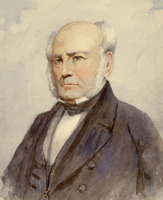 Mackenzie, who had been facing bankruptcy, received damages of £625 in the ensuing trial, and the award was collected by subscription from disgruntled senior members of the “family compact” and from York lawyer Samuel Peters Jarvis, now almost 34 years old, who on that June evening had led the group of young men in their late teens and early twenties. His hot temper and misplaced sense of pride had once again led to his involvement in a questionable affair with negative consequences for the cause he espoused. Despite this second blot on his public character he obtained the position of deputy provincial secretary and registrar through an involved rearrangement of government posts in 1827. 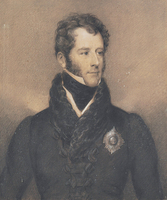 The following year Lieutenant Governor Sir Peregrine Maitland pointed out in a memorandum to his successor, Sir John Colborne*, that although Jarvis’s “very imprudent Act” had had “an effect injurious to the Government,” Maitland did not feel that his past actions should interfere with his chances for advancement. 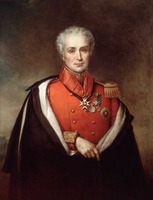 Jarvis occupied the position of deputy secretary until 1839, but he was not destined to succeed to the secretaryship itself. 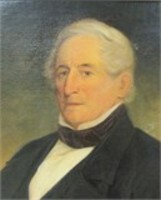 Instead, he had to content himself with the post of chief superintendent of Indian affairs for Upper Canada, to which Lieutenant Governor Sir Francis Bond Head* had on short notice seconded him in June 1837 when it had become evident that the Indian Department’s aged incumbent, James Givins*, was growing senile. 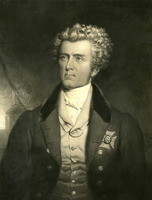 With the outbreak of the rebellion of 1837–38 a few months later, Jarvis was active in defending the established order and in hunting down suspected rebels. In December 1837 he raised and commanded a unit of militia volunteers named the Queen’s Rangers and at the end of the month he witnessed Andrew Drew* and his men setting fire to the rebel steamer Caroline at Navy Island. 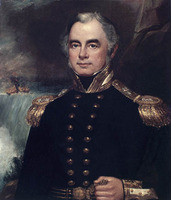 On his return from Niagara early the following year he acted as commandant of the Toronto garrison and in March was president of the court martial which tried the American Patriot, Thomas Jefferson Sutherland. That September, Provincial Secretary Duncan Cameron died. Jarvis’s frustration must have been great when Lieutenant Governor Sir George Arthur refused to recognize his services or consider his pleas about the temporariness of his Indian Department position. 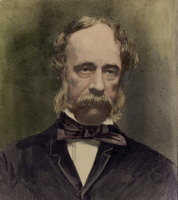 The provincial secretaryship was granted to Richard Alexander Tucker*, the former chief justice of Newfoundland, who had recently arrived in Upper Canada; Jarvis remained chief superintendent of Indian affairs. During Jarvis’s term of office (1837–45) no government department was to be examined so closely or so often as Indian affairs. The first inquiry took place in 1839. 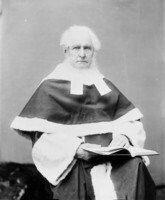 Sir George Arthur commissioned Judge James Buchanan Macaulay to take over the inquiry begun by Tucker and act as a one-man board of investigation. Macaulay thought the department’s chief problem was attracting “persons sufficiently diligent, active and zealous” to supervise its programs. His report of April 1839 was followed in January 1840 by a second one, composed as part of a general examination of all departments of the government which had been carried out by several committees. The Indian Department was reviewed by committee no. 4, whose three members, Macaulay, Vice-Chancellor Robert Sympson Jameson, and William Hepburn, a former clerk in the department under Givins, congratulated Jarvis for the vigour with which he carried out his official duties. The chief superintendent appeared to have passed his first two tests with flying colours. These appearances, however, were deceptive: Jarvis was a close friend of Macaulay’s, whose views were reflected in both reports. A third investigation was to have very different results. In 1842 Governor Sir Charles Bagot* established a three-man royal commission to inquire into the structure of the Indian Department in the new province of Canada. Its first report, delivered in January 1844, was directly responsible for Jarvis’s being stripped of his official rank in all but name that May and for his forced retirement the following year. Chaired by Rawson William Rawson, the governor’s civil secretary, the commission found the department’s administration chaotic and the chief superintendent incompetent and possibly dishonest. Indian Department accounts could not explain the whereabouts of more than £4,000, a sum which was later adjusted to an amount in excess of £9,000 and then again revised downwards. Jarvis’s attempts to defend himself only resulted in new evidence being gathered against him. 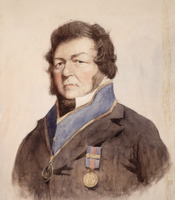 In contrast to the two previous inquiries, the commission found him evasive and uncooperative, a view that would be shared by Rawson’s successor as civil secretary, James Macaulay Higginson*, who assumed responsibility for the Indian Department on 15 May 1844. What had happened to the man who seemed to be a model administrator as late as 1840? It would be attractively simple to see Jarvis as merely a larcenous official who was found out. A more adequate explanation is that he was unfamiliar with mid-19th-century accounting techniques. He maintained both his private and his official department accounts at the Bank of Upper Canada, of which he was also a director, and juggled money back and forth between the two in the gentlemanly, informal, and confused manner of an earlier period. The Indian Department’s bookkeeping had always been problematic: Jarvis was simply unfortunate enough to be the first chief superintendent asked to provide such a detailed accounting. In this regard he was utterly dependent upon his chief clerk, George Vardon, who may have had reasons of his own for wishing to see Jarvis discredited. As chief superintendent, Jarvis was subjected to strains that would have been intolerable even for an individual whose competence was unquestionable. His official position embroiled him in the affairs of the Grand River Navigation Company, the interests of which were often antithetical to those of the Six Nations Indians on the Grand River Reserve. Indeed, he was president of the company in 1843–44, precisely at the time he was being forced to defend himself against the findings of the Bagot commission. Jarvis, who found the Indian Department confusing enough, was ill equipped to deal with all these matters simultaneously. The office of chief superintendent was abolished on 1 July 1845 and Jarvis retired from the Indian Department in disgrace. He continued the attempt to clear himself of charges of peculation but seems never to have been successful. On the other hand, the government seems never to have forced him to restore the missing funds for which it claimed he was responsible, an indication that the issue of his corrupt behaviour was not as clear as it had first appeared to be. Right up until his death Jarvis was still trying to untangle his complex financial affairs. In order to pay off some of his debts he had hired John George Howard* during the summer of 1845 to subdivide for public sale the 100-acre park lot east of Yonge Street which he had received from his father in 1816. Two years later Hazelburn, the house he had built there for his family 23 years before, was torn down to make way for the street which still bears Jarvis’s name. Yet despite his precarious financial position his last years were spent pursuing the activities of a socially well-connected, semi-retired man of private means: fishing trips to the Gaspé, hunting in the Bruce Peninsula, grand tours of Great Britain and the Continent. In the middle 1850s his health declined; he died in 1857 and was survived by his wife and seven of his children. 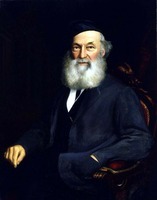 His eldest son, Samuel Peters Jarvis Jr, had a distinguished career in the British army; other descendants took their places in the professional and business life of Toronto. Samuel Peters Jarvis wrote two works concerning his early misadventures: Statement of facts, relating to the trespass on the printing press, in the possession of Mr. William Lyon Mackenzie, in June, 1826; addressed to the public generally, and particularly to the subscribers and supporters of the “Colonial Advocate” published anonymously in Ancaster, [Ont. ], in 1828 (another edition was issued at York [Toronto], probably in the same year); and To the public; a contradiction of “The libel,” under the signature of ‘A relative,’ published in the “Canadian Freeman,” of the 28th February, 1828; together with a few remarks, tracing the origin of the unfriendly feeling which ultimately led to the unhappy affair, to which that libel refers ([York], 1828). The “unhappy affair” is the Jarvis–Ridout duel of 1817; the matter was revived in a letter published in the Canadian Freeman (York) on 28 Feb. 1828 under the signature and title quoted by Jarvis. The original letter is republished on pp.3–8 of the pamphlet as a prelude to Jarvis’s refutation. AO, MS 35; MU 1127, McCormick–Dunsford–Jarvis–Read family tree; MU 1532–37; RG 22, ser.155, will of S. P. Jarvis. Law Soc. of U.C. (Toronto), “Journal of proceedings of the Convocation of Benchers of the Law Society of Upper Canada” (8v., ms), 1810. MTL, S. P. Jarvis papers. PAC, MG 19, F24; RG 10, A1, 6–7; A4, 47–77, 124–39, 498–509, 739, 748–49, 751; A5, 142–50, 510–12, 752–60; A6, 718–21; C2: 10017: 80–81. Can., Prov. of, Legislative Assembly, App. to the journals, 1844–45, app.EEE; 1847, app.T, app.VV. Town of York, 1815–34 (Firth). Montreal Gazette, November 1846–February 1847. Montreal Herald, November 1846–February 1847. Pilot (Montreal), November 1846-February 1847. Armstrong, Handbook of Upper Canadian chronology. Chadwick, Ontarian families. 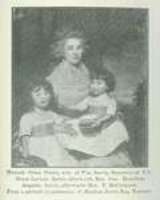 The Jarvis family: or, the descendants of the first settlers of that name in Massachusetts and Long Island, and those who have more recently settled in other parts of the United States and British America, comp. G. A. Jarvis et al. (Hartford, Conn., 1879). R. J. Burns, “The first elite of Toronto: an examination of the genesis, consolidation and duration of power in an emerging colonial society” (phd thesis, Univ. of Western Ont., London, 1974). J. D. Leighton, “The development of federal Indian policy in Canada, 1840–1890” (phd thesis, Univ. of Western Ontario, 1975). Middleton, Municipality of Toronto, 1: 96–99. Scadding, Toronto of old (1873). A. S. Thompson, Jarvis Street: a story of triumph and tragedy (Toronto, 1980). R. J. Burns, “God’s chosen people: the origins of Toronto society, 1793–1818,” CHA Hist. papers, 1973: 213–28. [J.] D. Leighton, “The compact tory as bureaucrat: Samuel Peters Jarvis and the Indian Department, 1837–1845,” OH, 73 (1981): 40–53. Douglas Leighton and Robert J. Burns, “JARVIS, SAMUEL PETERS,” in Dictionary of Canadian Biography, vol. 8, University of Toronto/Université Laval, 2003–, accessed April 24, 2019, http://www.biographi.ca/en/bio/jarvis_samuel_peters_8E.html.